Penthouse P1 is the masterpiece of the Palais Varnhagen. Inspired by the historic townhouse, it combines grand flair and simple elegance over its 382 m². In full keeping with the idea of 19th century „salon life“, it offers abundant space for stylish get-togethers on the 6th floor and, with its separate sleeping area on the 7th floor, preserves the resident’s sense of privacy. David Chipperfield employs special details like ceiling-high doors with bronze handles, the recreated 19th century panel parquet flooring, and airy ceilings rising up to 6 m to create a unique living space. The large terrace on the salon floor and the stunning rooftop terrace open the spacious rooms up to the outside world and offer a fantastic view of Berlin. Generous, representative and bright – these are the qualities David Chipperfield has instilled in his centrepiece, the penthouse. A ceiling up to 6 m in height creates a unique space and the large windows provide an incomparable lighting experience. Whether hosting a dinner or a reception, the spacious floor plan offers a stylish setting for successful events. The elegant fireplace conjures up an especially warm atmosphere on cool evenings. Even in the sleeping area, the signature of David Chipperfield is evident. The generous bedrooms exude elegant comfort and a feel-good atmosphere. With the floor heating under the high-quality wooden floors and the air conditioning, a pleasant indoor climate remains consistent throughout the seasons. The dressing area of the master bedroom and the bathroom adjoining both bedrooms underscore the exclusivity of the penthouse. Walls and floors in light travertine, contrasting mosiac tiles, a free standing bath, and a sauna- all with an elegant design and high-quality fittings, even the guest toilet itself, evokes the feeling of an exclusive spa. The hand-picked furnishings of the bathrooms, in combination with the natural stone and smooth plastered walls, emphasize the elegance of the overall composition. 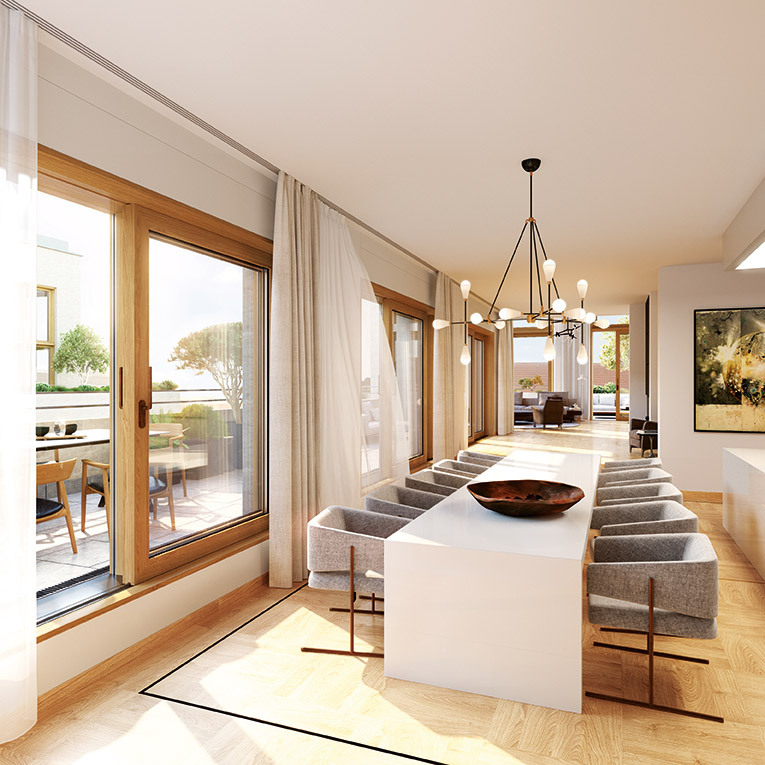 High-quality, elegant, and timeless – just like the selection of materials chosen by David Chipperfield for the penthouse in the Palais Varnhagen. Take his special floor concept, for example: faithful to the style of the historic townhouse, the salon preserves the large-sized panel parquet flooring with frieze edging, while the other rooms are adorned with harmoniously coordinated floorboards. A total of three fireplaces instil a particularly warm and welcoming atmosphere, and the exclusive design of the bathrooms is inspired by an elegant spa.